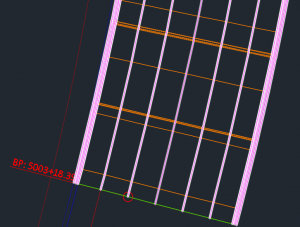 A sure way to bog down a corridor and enlarge the file size of the drawing is to have too many frequency lines in a corridor. The optimal number of frequency lines in a corridor should be thought of as just enough to accurately define the intended geometry and not one extra line. Let’s take a look at a corridor. The orange lines are the frequency lines and the magenta & white lines are the feature lines. We can see that it looks like some frequency lines are spaced at a specified interval, while others are all bunched together. If we zoom in on our frequency lines we can see in one location there are 5 frequency lines inserted into our corridor over a distance of less than a foot. It looks like there is more than one location like this here. This many frequency lines bunched up in one location is very unnecessary and does not add anything of value to our corridor definition. Removing unnecessary frequencies will speed up corridor rebuilds and make the file size significantly smaller. Let’s note our file size before we go further. The top file contains our corridors and is appx. 17MB. 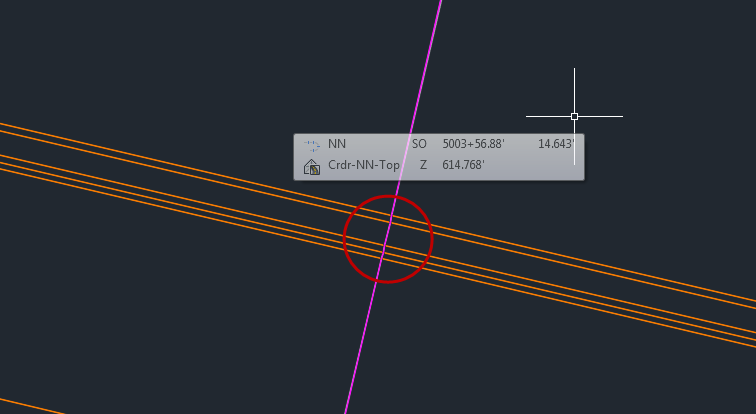 Some people may turn all the frequency options on, thinking the corridor will be more accurate with more lines and being more accurate is good, right? Not necessarily. Let’s zoom out and get the big picture. This corridor geometry is made up of mostly smooth, large radius curves and long tangent sections. We certainly don’t need our model to communicate 5 frequency lines in a one foot length of corridor to our contractor. He’s not going to stake the road out using a ruler. So, what settings contribute to adding the most extra frequency lines? Let’s check the settings in our Frequency to Apply Assemblies Dialog Box. 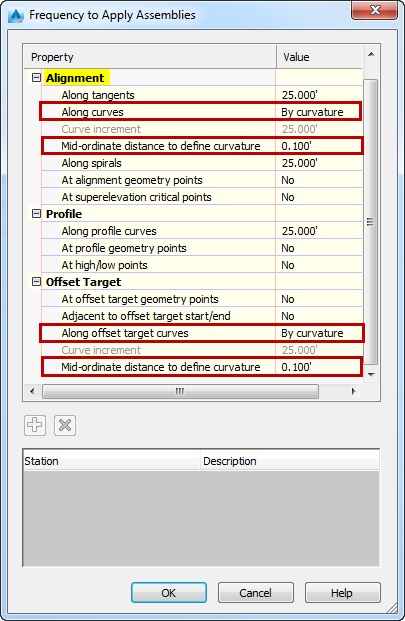 Specifically, the settings that effect frequency in curves. 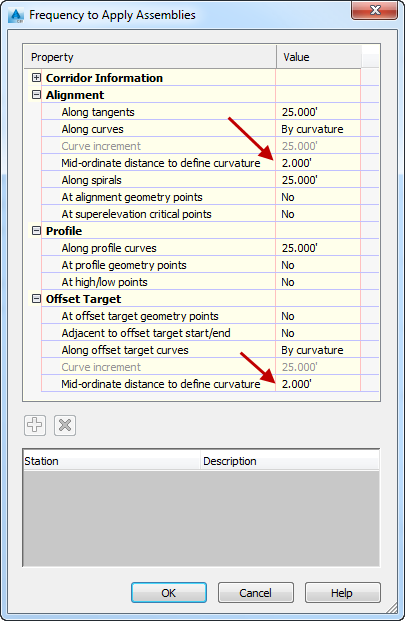 Setting the frequency for Along curves and Along offset target curves to “By curvature” and also having a very small” Mid-ordinate distance to define curvature” value will fill the corridor with many more frequency lines than are necessary. This combination of settings can create a ridiculous amount of extra frequency lines. Let’s rebuild and take a look. The bunched up frequency lines are gone. 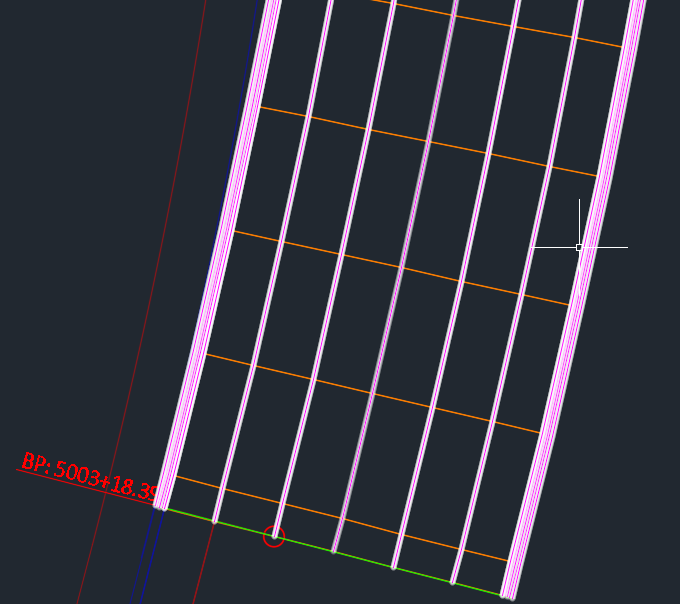 I’m happy with this corridor showing only 25’ increments at this point. Remember, specific stations can be added manually if the definition requires it. Let’s look at the file size now. 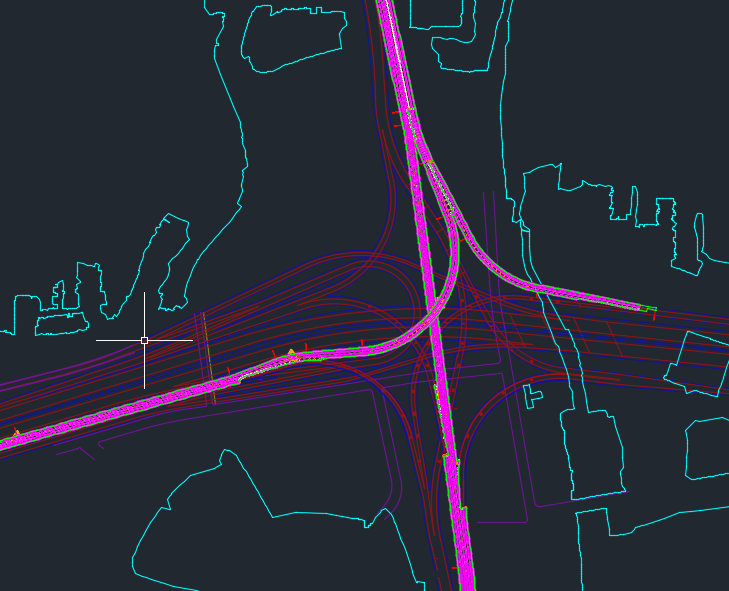 Our file size has gone from 17MB to 11MB and we haven’t lost any significant data needed to construct this road. 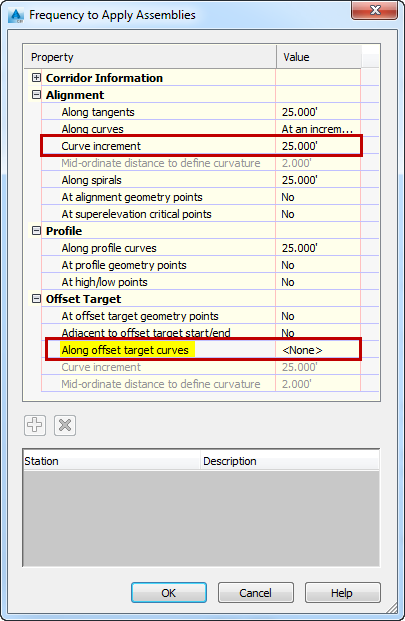 Let’s go one step further, and set Along curves to “At an increment”, and Along offset target curves to “<none>”. Let’s check the file size again. It is now even smaller, from 11MB down to 9MB. Even in this small file I can enjoy tangible gains from changing the curve settings. The corridor builds faster and the file takes less time to open. An even larger file would see even more gains.